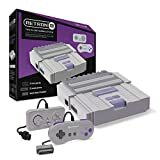 Look, I’m not trying to be a party pooper here, but I seriously have no idea why people are so into retro consoles like the NES Classic Edition and the Super NES Classic Edition. Don’t get me wrong, I love old school video games. But why on Earth would you buy a console that comes with a handful of preinstalled games and can’t play any game cartridges? Forget that, get the Hyperkin RetroN 2 Gaming Console for SNES/ NES instead. It can play literally every single NES and SNES game cart ever made, and it only costs $40 on Amazon.